Samuel Thomas Gill, Diggers on route to deposit gold, c1852, watercolour and gum arabic on paper. THE LATE MR WILLIAM SMITH - A SKETCH OF HIS CAREER. The late Mr William Smith, of Elphinstone whose death took place on the 20th ult., was born on January 24th, 1827, in county Wexford, Ireland. He had a twin brother, who emigrated to America, and predeceased him by 17 years, leaving a long list of descent ant. In 1852, Mr Smith, with his wife, came to Australia on the Tippo Sahib. It was his intention to return to the old country in a few years' time, hut many years elapsed before his intention could be carried out. Arrived in Melbourne, it did not take the young man long to make hit mark. His ability and efficiency in checking boats cargo was noticed by Captain Cole, who placed him in charge of Cole's bonded stores remained in this position until drawn by the gold fever of the days to the diggings. Captain Cole thought so much of the young man that he kept the position open for him for some considerable time. But Mr Smith did not return for, although meeting with varying success, the free and easy life had a charm for him, and he was never more comfortable than when in his good "fly" tent. He had many strange and interesting story to tell of the Eureka Stockade period of Victoria's history. 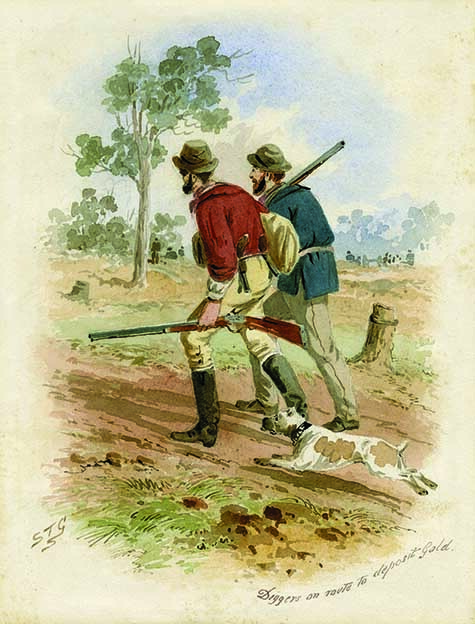 Although he believed the miners of Ballarat were unfairly treated by the Government, he was too loyal a subject to rise in defiance; he preferred to seek redress in another way. Later, Mr Smith settled in the Castlemaine district, and in 1875 was appointed Valuer and Collector of Metcalfe Shire. This position he held for over 30 years. in 1907, after the death of the faithful partner of his life, he visited his old home in Ireland. The trip had been his desire, and his intention for many years but it proved a strange mingling of joy and sorrow. All his brothers bad predeceased him, and a nephew, Mr S. A. Quam-Smith, and grandnephew (who later on visited him at his home) were the only representatives of his family in Ireland. But, after an absence of so many years, Mr Smith had many amusing experiences of meeting with men who proved to have been schoolfellows. Among the friends of his early manhood years, were Mr T. Irvine (father of Mr Hans Irvine), and Mr. Hawkes Cornick, of Cromwell's Fort. Both these early friends were living when he visited Ireland and he spent many hours with them indulging in reminiscences. The deceased gentleman is survived by two sons and four daughter. One of the sons, Mr T. H. Smith, of Sutton Grange, is a Justice of the Peace, and was formerly a councillor of the Metcalfe Shire. The other is a Police Magistrate; of the daughters, two are married, and two unmarried. The married daughters are Mrs. Owens of Mysia, and Mrs. Voight, of Melbourne. ↑ Mount Alexander Mail, 05 December 1913. This page was last edited on 6 August 2017, at 10:14.